Wildplant Rescue Service is located in Katoomba in the Central Blue Mountains in Australia about 100 km west of Sydney. Wildplant Rescue Service was established by the local community in 1994 as a not-for-profit organisation committed to save natural plant heritage of the urban areas of the Blue Mountains being destroyed for development . The Blue Mountains Wildplant Rescue Service is the first of its kind in Australia. The volunteer, not-for-profit was formed to help protect and promote the natural values of the Blue Mountains. ‘The City of Blue Mountains, dubbed ‘The city within a National Park’, was uniquely positioned to benefit from the formation of a pilot Wildplant Rescue Service. This recently listed World Heritage area, then home to more than 75,000 people, was under continuing pressure from more than 500 building permits issued every year, with most of the development affecting unspoiled native vegetation. ‘As the group evolved, the original idea of rescuing native plants developed into a bigger plan. The group became aware of the importance of protecting wildplant and wildlife communities in the Blue Mountains on a broader scale than solely rescuing condemned wildplants. 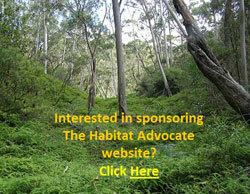 It is the aim of The Habitat Advocate, once established, to tangibly support Wildplant Rescue in its endeavours. The editor currently is a member of Wildplant Rescue Service.